I’ll be surprised if there isn’t at least one Newbridge side in the Kildare senior final after Sunday’s semi-finals and I wouldn’t rule out a Moorefield-Sarsfields county final. Nothing gets the juices flowing in either side quite like the sight of the other half and you can be sure that both clubs would love nothing better than an all-Newbridge final. But here’s why it won’t happen: Moorefield aren’t good enough. They are too unreliable over the course of 60 minutes and there is only so long they’ll get away with playing one half of football. At the back they are vulnerable against pacey forwards and they conceded too many goals for my liking against Clane. Their half-back line has been impressive going forward but I have my doubts when they are put on the back foot, which they will be against Athy. I think Athy will go hunting for goals early on and there is a good chance they will get them. Moorefield have been racking up big totals but it has been against average defences and if their starting six don’t perform, they don’t have any game-changers on the bench. Athy are coming into form at just the right time and even if they are not in fifth gear, they can inflict enough damage up front to reach the final. 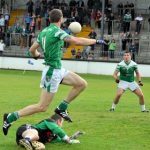 Having pipped a fine Confey side in the quarter-finals, it’s hard to see Sarsfields having much trouble against an extremely average Naas side in the other semi-final. Naas are blessed to have gotten this far and considering Carbury ended up in the relegation play-offs, they probably should have been scrapping for survival this year too. The best they can hope for is a narrow defeat because they can have no thoughts of victory with an attack that wouldn’t punch holes in a paper bag. Sarsfields are actually playing much better than they were last year when they won the championship so a double will definitely be on the cards come Sunday night. Well at long last, Johnstownbridge grew a pair of balls and got themselves into an intermediate final. It’s only taken them about two decades to do what they should have done five years ago. Even with their emphatic semi-final win and the vast array of talent in their ranks, there is no value in backing them for the final. They will be short-priced and until they win this championship, they remain suspect under pressure. One thing is for sure, Castledermot will let them know they’re in a game and we won’t be long finding out if Johnstown have the stomach for it in the final. Don’t be foolish enough to think this will be a one-sided final. There is plenty of genuine football talent in that Castledermot side and I’d have far more faith in them producing a performance on the day than I would in their opponents. Winning the middle tier is never easy in Kildare and the eventual winners nearly always look like a senior side in waiting long before they do get promoted. In that case both sides have looked good enough for senior this year and the final may well be decided by a small margin. Johnstownbridge should win but those mercurial men from west Kildare are hard to figure out. If they get their heads right, and that is a big if, they will win it. Otherwise Castledermot will chew them up, spit them out and leave them brooding for another year. You can be sure both clubs would love nothing better than an all-Newbridge final. But here's why it won't happen: Moorefield aren't good enough"